Don't you just hate not being able to confidently put together a knockout outfit on your own? I know I do. 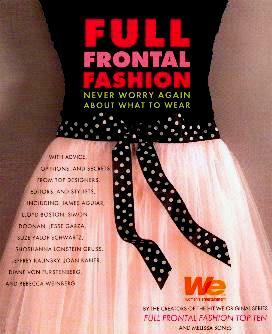 Well, don't despair, the WE:Women's Entertainment team have come up with this helpful book for us. My "problem" is that I hate looking like everyone else and really hate seeing rows of the same outfit in stores, and I cannot afford to have my own dressmaker to make one-of-a-kind things for me. So, I try to customize plain and ordinary things to look different. Many women are, however, quite content working with what's out there. This book helps you find your fashion personality (Classic, Preppy, Fashion Forward, Eccentric, Bohemian, the Uniform Dresser, Hot, Park Avenue Chic, Jet Set, and Mixing It Up) - see if you can honestly identify yourself - and once we know which one we are, we can take it from there. There are great tips for the corporate woman and her wardrobe, dos and don'ts, dressing for interviews, out in public, what to wear to parties or other invites, traveling, casual attire, and on dates. Conclusion - Very useful in helping you get yourself suitably kitted out.